In the early 1900s Hiram "Gus" Rodee cleared some trees along the Jim River near Forestburg, South Dakota and built and amphitheater and hotel. It soon became the entertainment center of Sanborn County and the surrounding area. There was even a railroad station for special trains that brought people to the park. In 1910 Robert Dowdell and Ben Millard purchase the park and expanded it to include a dance pavilion, grandstands, racing stables, worker's lodges, and a hotel. Activities such as horse races and car races were very popular. Are residents claim that some special events drew as many as 15,000 spectators. The rock and roll era was introduced to the park in the late 1950's. Many weekend dances drew over 1,000 people on a single night. 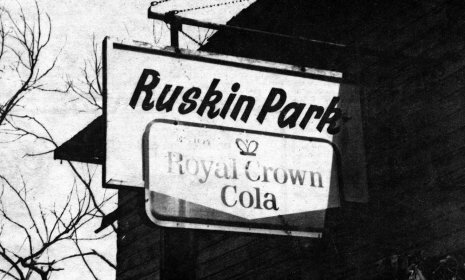 Ruskin Park earned a reputation as a "rowdy" place but quite often fights were over girls and took place outside of the pavilion. Inside the kids danced to not only local favorites like Myron Lee but national recording stars; Jerry Lee Lewis, Buddy Knox, and the Everly Brothers. On weekends crowds would sometimes exceed 1,000. Walter and Dagmar Siegenthaler operated Ruskin Park from the mid fifties until 1967. The Siegenthalers were very successful at bringing in the best entertainment available and fans poured in from all over the state. You may have even heard the Flippers visit to the park advertised on KOMA in Oklahoma City. Unfortunately Walter passed away and Dagmar closed the park in 1968. The buildings were eventually torn down and Ruskin Park is no only a memory but for those who were lucky enough to have experienced its magic, it will never be forgotten.